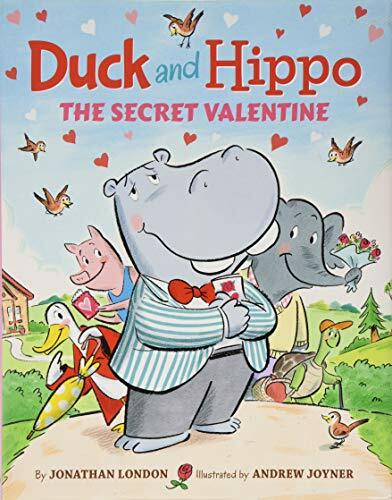 Duck and Hippo: The Secret Valentine is book four in a series by Two Lions Press, an Amazon imprint. Jumping in with the Valentine book was a bit confusing with all the different characters: Duck, Hippo, Turtle, Pig, and Elephant. The animals wear clothes, live in houses, and one works in a pizza parlor. The story is a mystery. Someone is leaving secret Valentine cards for the animals, telling them to meet at the park at 4:00. Each animal gets ready and also brings a gift for his or her secret Valentine. Turtle brings doughnuts, Pig brings pizza, Elephant brings a batch of flowers, and Hippo brings chocolates and flowers. Duck leaps out of the bushes and admits that she is the secret Valentine, and that the best valentines are friends. The best lines are when Turtle thinks the big red heart looks like pizza with a slice out of it, or when he sees the fish in the pond blowing kisses at him. Turtle gets to think the best thoughts. The art by Joyner is cute, with Hippo in a striped sport coat and bowtie, Pig in a blue dress, Elephant in a yellow sweater, and Turtle in a red baseball cap. Duck wears a red coat. Elephant balances doughnuts on his nose. The palette is on the pastel side with black outlines and dashes of red. The end papers are pink, of course. The pages are filled with fun sound words, like KNOCK-KNOCK-KNOCK, RING-A-Ding Ding, SPLAT, TWEETLE-DEE, HUSHA-SHUSHA-SHUSHA, and SMACK. Then there’s TICK-TOCK, TICK-TOCK, BRUSH-BRUSH-BRUSHA, BOP, SMOOCH, SMOOCH, SMOOOOOOCH, and SCRUBBA-DUBBA-DUBBA. The simple story is perfect for the preschool set, who will love repeating the sound words. An older child might wonder how a hippo and elephant can co-exist with a duck and pig, and where in the world would that combination of animals exists? The younger child won’t care and will enjoy the fun times of this frolicking quintet of friendship. Duck and Hippo: The Secret Valentine is a happy story of friendship, perfect for circle time at preschool or one-on-one time in a parent’s or grandparent’s lap.